Axial Length, ACD, WTW, PupilSize and Keratometry values can be imported from the Nidek AL-Scan optical biometer. On the AL-Scan the data must be exported as XML files into a shared folder. 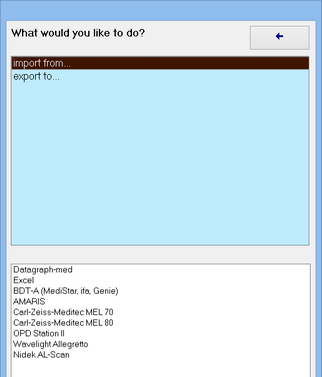 Select this folder from Datagraph-med and start the import procedure by clicking 'import to this record' from the 'surgery tab' of the data entry form.